Let me make this clear. I want Anquan Boldin back. I really want Donte Whitner back. But I NEED Phil Dawson back. There’s no doubt that Boldin and Whitner were huge parts of the 49ers success last season, but Dawson was crucial to San Francisco reaching the heights they reached. Losing Whitner will impact the locker room the most. Losing Anquan Boldin will impact Kaepernick’s success the most. 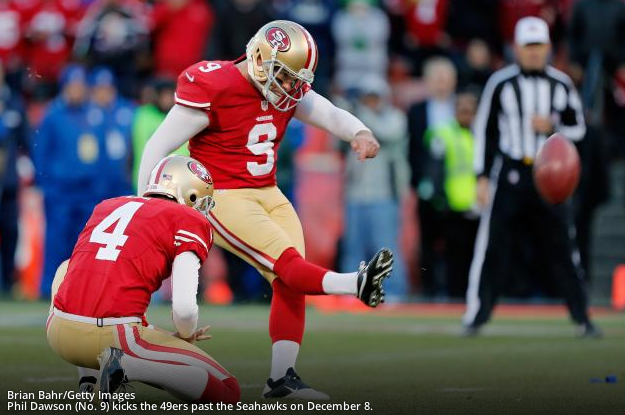 If the 49ers don’t retain Phil Dawson, it’s the win column that will take the hit. Phil Dawson was one of the best field goal kickers in the National Football League last season. Dawson was a ridiculous 32-36 in the regular season, booting balls through the uprights in an array of conditions. He canned 21 yard chip shots in rainy Seattle, extra points in London, 52 yard bombs in windy Candlestick, and everything in between. “Money Phil” also had a perfect playoffs, not missing a field goal or extra point during the postseason. He hit game winners at home against Seattle in week 14, in Arizona to clinch the 5 seed, and in 8 degree weather at the notoriously tough Lambeau field to send the Niners to the divisional round. He made a franchise record 27 field goals in a row and finished the season with the second most field goals (32) and points (140) in team history. Phil Dawson was at the top of his game last season and deserves to come back and kick football’s for the San Francisco 49ers. Only 5 kickers in the entire NFL turned in better percentages (makes/total attempts) with as many/more attempts than Phil Dawson last season. Keep in mind that one of Dawson’s “misses” was a 71 yard free kick attempt against the St. Louis Rams. He is absolutely a top 5 kicker, and not a replaceable commodity by any means. This is a big part of why the 49ers need to retain him. There are not kickers available with the skill and consistency of Dawson. Dawson’s FG percentage has only dipped below 80% 3 times in his entire career, the latest coming in 2006. And he’s kicked in Cleveland’s FirstEnergy Stadium and Candlestick Park, not quite ideal kicking conditions. Boldin and Whitner can both change a game in ways that Dawson can’t. Nothing “Money Phil” ever kicks will change the momentum of a game like Whitner’s stone cold demolishing of Pierre Thomas in the 2011 NFC Divisional round. No matter how many field goals Dawson kicks, he’ll never be able to take over a game like Boldin did in week 1 like against Green Bay. That said, Dawson has a bigger impact. The Niners are a team that struggles to find the end zone. Since 2007, they rank 27th in TD percentage inside the red zone. They lead the league in field goal attempts inside the red zone as well. While this isn’t something the Niners should strive to continue, kicking field goals remains a huge part of their offense. Having a good kicker means these red zone failures at least end in three points. How many times have we seen the Niners drive down the field on the first drive, only to settle for three (It happened in each of the three playoff games)? Phil Dawson turns those failures into points with remarkable reliability. And that’s why he’s a valuable asset that should be retained immediately.